Who and What is Athletic Greens? 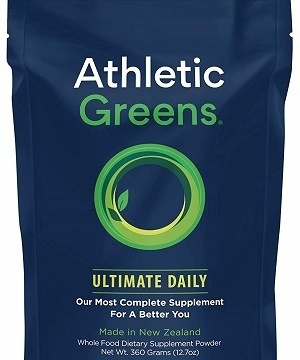 Based in Las Vegas, Athletic Greens is a manufacturer of a green powder supplement called Athletic Greens Premium Ultimate Daily (previously Premium Superfood Cocktail). A catchy name for a product marketed as a whole food green powder that combines eleven different types of supplements into one. The powder is manufactured in a Good Manufacturing Practice (GMP) certified facility in New Zealand, using only raw materials from reputable, quality sources. The purpose of drinking Athletic Greens is to improve your alkalinity, digestive health, immune system and energy levels. To live a healthy life, your body and mind need a nutritious diet, regular exercise and sufficient restful sleep. Athletic Greens is an excellent supplement that helps you keep up with the pace of life and correct the inevitable nutritional gaps. Provide your body with a great variety of essential nutrients, vitamins and minerals. Improve digestion to help your body absorb more essential nutrients. Deliver directly to cells so that your body can utilize these nutrients. There is no denying that Athletic Greens is an incredibly powerful supplement, especially compared to other supplements in the same category. 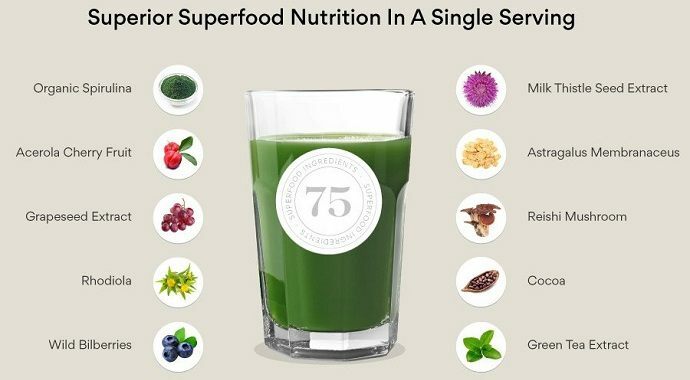 It contains no less than 75 different high quality ingredients, with one scoop of Athletic Greens being equivalent to 12 small servings of different vegetables. Not only is Athletic Greens rich in nutrients, it also provides your body with the necessary probiotics and digestive enzymes to help absorb and synthesize the nutrients. Athletic Greens is formulated such that almost anyone can take it, and is suitable for all types of diets, including paleo, primal, vegan and vegetarian. It contains no harmful chemicals, artificial colors, artificial flavors, preservatives or artificial sweeteners. In addition, it’s free from GMO’s, herbicides, pesticides, wheat, yeast, dairy, gluten, lactose, peanuts and animal products. The below table shows an extract of the most important nutrients in one scoop of Athletic Greens Ultimate Daily. I’ve highlighted some of the recommended daily value percentages as they appear to be somewhat excessive. Or in other words, there seems to be a bit of an imbalance in nutrients. 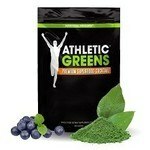 To read more about the ingredients and how they are sourced, go to the Athletic Greens website. 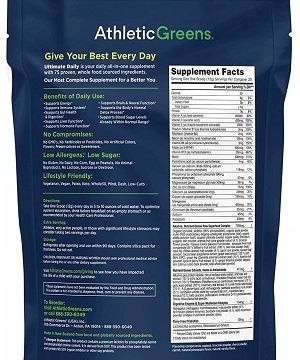 First and foremost, I am not a scientist, and I have not tested whether this Athletic Greens product actually contains all the ingredients and nutrients that the package claims it contains. I just have to assume that they’re truthful about what’s in it, and I’m sure there’s independent organizations that do validate these types of products. I’ve used it for a month, with one scoop each day. I also decided to leave everything else in my diet as is. Except for one thing: I skipped my green smoothies during this month. In other words, I wanted to find out whether there was a noticeable difference in how I would feel compared to my normal lifestyle with 4 or 5 green smoothies per week. I tried hard to eliminate any other factors that could possibly influence my energy levels and mood. I’m happy to say that I was indeed feeling quite energetic from one week into this test, and it remained that way for the rest of the month. And yes, I can honestly say that my energy levels were a bit higher than what I was used to. Whether this can be 100% attributed to Athletic Greens is very hard to say. I certainly won’t be making that claim, but at least I was not feeling worse. In fact, I did not only feel energetic, but I was also consistently in a good mood. I don’t see Athletic Greens as a meal replacement. No dietary supplements should ever be considered meal replacements. Nothing beats fresh, healthy produce, and supplements should only be used as an addition to your diet if your regular diet does not provide you with sufficient nutrients. Instead of a meal replacement, you can see Athletic Greens as a supplement that can replace all your other supplements. That’s the best way to describe it. As with any product, there are pros and cons. No product is perfect and the Athletic Greens Ultimate Daily all-in-one green powder supplement isn’t either. The following pros and cons are my personal opinion. What may be a negative in my opinion, may well turn out to be a positive for someone else. There is no denying that Athletic Greens provides you with a huge amount of nutrients with just one scoop. Compared to other, similar green powder supplements, Athletic Greens definitely stands out. When choosing a supplement, make sure to always read the label and make a decision based on that, not so much on price. When you have a closer look at the label, you’ll notice that the nutrients are coming from a wide variety of different food sources. Have you ever had grape seed extract, rhodiola or reishi mushroom, to name just a few exotic ingredients? It’s comforting to know that Athletic Greens has not just stuffed their supplement with cheap synthetic ingredients. It really does taste very decent. A lot of these types of supplements are a pain to drink with an often bitter, grassy aftertaste. But Athletic Greens has actually done a good job at making this a flavorful supplement. A simple glass of water with one scoop of Athletic Greens is very drinkable. The powder is very, very fine. Each time you open or close the pouch, some powder escapes which is a bit of a nuisance. This is particularly the case when the pouch is still quite full. You can avoid this though by being very careful when opening and closing. Yes, Athletic Greens is expensive compared to other, similar supplements. But this needs to be put in perspective. The amount of nutrients you get is amazing, and if you had to purchase individual supplements for each group of nutrients, you would be paying a lot more. But still, it is a reasonably big financial investment that needs to be thought through properly. One scoop provides 700% of your daily recommended vitamin C intake which seems excessive. Vitamin C is one of the most common nutrients out there with most fruits and vegetables containing a good amount of it. I would personally rather see a decrease in vitamin C and an increase in nutrients such as magnesium, potassium and calcium. As it is now, you would still need to consume leafy greens to make up for it. Where to Buy Athletic Greens Ultimate Daily? 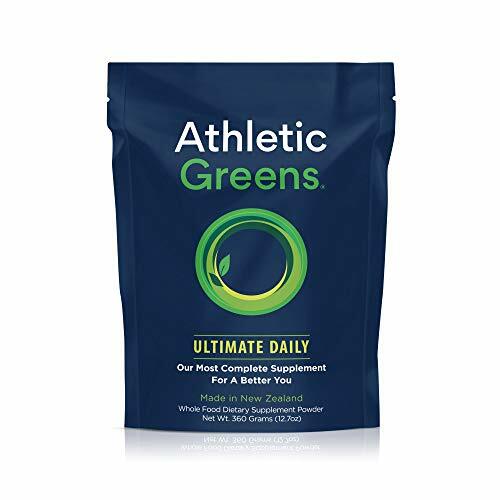 You can purchase Athletic Greens Ultimate Daily either from them directly or from Amazon. Price wise it doesn’t make much difference. You can choose to purchase a single item to try it out first, or you can go for a monthly subscription which turns out more affordable per pack. Vibrant Health is a trendsetter as they were one of the first to come to market with a green powder supplement back in 1992. 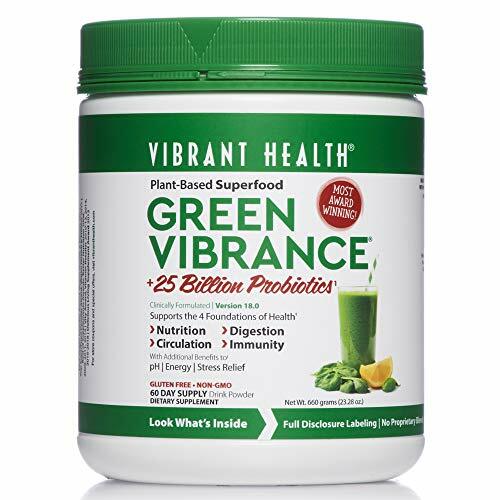 Their popular Green Vibrance product contains more than 70 ingredients extracted from different fruits and greens such as spirulina, wheat grass juice and barley grass. Not only does this supplement provide you with a great variety of different vitamins and minerals, it’s also loaded with probiotics and digestive enzymes. 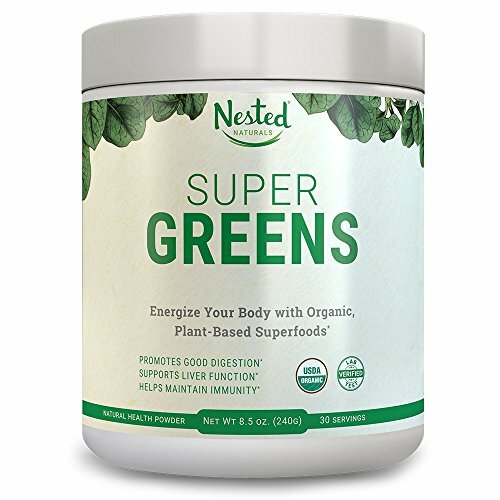 The Nested Naturals Super Greens supplement is another popular green powder consisting of more than 40 different ingredients. Nested puts effort into sourcing top quality, natural, ethically produced ingredients with at least half of them being organic and all of them non-GMO. In addition to vitamins and minerals, their Super Green product also provides good amounts of antioxidants, probiotics and enzymes. 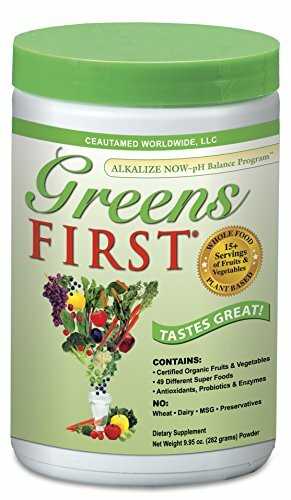 Greens First is a complete supplement that provides you with nutrients from 49 different super foods, extracts and concentrates including organic fruits & vegetables, super greens, fibers, herbs, probiotics, spices, flavonoids and digestive enzymes. This is a 100% non-GMO product and contains no artificial ingredients, sweeteners or preservatives. Yes, green smoothies! I’m a green smoothie fanatic and love experimenting with different fruits and leafy greens to get my nutrients in. Blending is part of my lifestyle and that’s why I personally wouldn’t buy green powder supplements. But that’s just me. If you don’t have a blender at home, or if you don’t have the time to regularly prepare nutritious green smoothies, a green powder supplement is an excellent alternative. Athletic Greens is one of those products that you really should research before buying. Don’t just buy a health supplement under the assumption that it will always work for you. It may in fact not work for you at all. This totally depends on your lifestyle and diet choices. For example, if your regular diet (that you also enjoy) already provides you with most of the nutrients that this product offers you, then there is no point purchasing this supplement. Unless you lead a very active and busy life so your body is in need of an extra boost in order to keep up. Ultimately, the word supplement implies that there must be a need for it. In other words, don’t use any supplements if there is no need for it. >> Buy this powerful supplement from Athletic Greens or from Amazon. Summary Athletic Greens Ultimate Daily is an all-in-one green powder supplement offering a huge amount of different nutrients with just one scoop. The nutrients are coming from a wide variety of different, often exotic, food sources. While certainly nutrient-rich, Athletic Greens Ultimate Daily contains too much vitamin C compared to other vitamins and minerals.